BACKGROUND: Trivandrum is a place with better educational status for women. The aim of this study is to describe young women's attitude toward gender-equitable norms. METHODS: A cross-sectional survey was conducted in Trivandrum, using multistage cluster sampling method. Participants were 18–28-year-old married (n = 203) and unmarried (n = 104) women. The scales of domestic chores and daily life domain items and violence domain items from the compendium of gender scales were used to assess the attitude toward gender-equitable norms. Pearson Chi-square test was used to check the significance of the associations. RESULTS: The high support to gender-equitable norms on domestic chores and daily life domain was 29% and 18% and violence domain was 25% and 14% among unmarried and married women, respectively. Education was interrupted among 55% of married women due to marriage, pregnancy, childcare, and lack of resources. The ability to take final decision to work outside the home (32% vs. 45%) and in obtaining health care (65% vs. 73%) was low among married women compared to unmarried women. Higher education did not affect the attitude of young women toward gender-equitable norms on “violence domain,” but the highly educated married women showed a slightly better support for “domestic chores and daily life domain” and had a major say in taking decisions on health-care seeking and work outside home. CONCLUSIONS: In general, the support for gender-equitable norms and the freedom in decision-making are not satisfactory among young women. Education alone cannot make rapid changes in the attitude of young women toward gender-equitable norms since it is strongly connected with social norms and practices. The rights to information, education, liberty, health care, and services; the rights to make decisions regarding marriage and sexual relationships without compulsion; and the right to be free from sexual violence are part of reproductive rights along with several other rights that are directly connected with the reproductive health of women., The Prohibition of Child Marriage Act 2006, the Right of Children to Free and Compulsory Education Act 2009, Protection of Women from Domestic Violence Act 2005, Medical Termination of Pregnancy Act 1971 (and amendment of 2002), and Protection of Children from Sexual Offences Bill 2011 are some of the laws in India which are directly or indirectly related to the reproductive health and rights. Kerala is well known for its educational attainment and improved health status of women. However, it has been shown that educational attainment is not contributing much to the decision-making power of women in Kerala, and especially, the young women have less autonomy in their reproductive decision-making irrespective of their educational attainments. According to the National Family Health Survey 4, only < 50% of women under the age of 30 in Kerala can go alone to a health facility and only 40% of women in the reproductive age can take decisions to utilize their money. The social norms and practices largely influence the attitude toward gender-equitable norms, and it contributes to the decision-making power of women. With this in the background, this paper examines the young women's attitude toward gender-equitable norms on “domestic chores and daily life” and “violence” domains, their perceptions toward educational attainments, work outside of home, and health-care seeking in a place with better educational status for women. The details of the cross-sectional survey and sample selection methods were described elsewhere., Trivandrum district consists of three types of local administrative areas such as 1 corporation, 4 municipalities, and 73 grama panchayats. Corporation includes the urban areas, municipalities include urban and semi-urban areas, and grama panchayats include semi-urban and rural areas. To get a representative sample from the Trivandrum district, an equal number of participants were recruited from the three administrative areas using a multistage cluster sampling method. The subdivisions of the administrative areas called wards were the primary units for data collection. A total of 15 wards from the three administrative units were randomly selected for the survey. The selection of wards was as follows: five out of 100 wards in the corporation; five wards from one randomly selected municipality; and five wards from five randomly selected panchayats. The target group of participants was the 18–28-year-old women, both married and unmarried. The purpose of selecting the age group of 18–28 years was due to the assumption that this age group needs special attention due to the high fertility concentrated in the age group of 20–29 years in both rural and urban areas of Kerala; the legal age for marriage for women in India is 18 years; the average age of marriage for women in Kerala was between 22 and 23 years; and the women who report a birth order of 2 or above among 20–24-year-old women were nearly 30%. It was decided to be included 200 married and 100 unmarried women in the survey. The field investigators identified one point in each ward and visited all households in one direction to identify the eligible women in the households and conducted the survey after obtaining their written informed consent if they were available and willing to participate in the study. The process continued until the required number of women from each ward was included in the survey. The data collection was completed in 3 months from January to March 2015. The Institutional Technical and Ethical Committees approved the study protocol. A structured interview schedule was used to collect the sociodemographic details and questions related to perception on educational attainment and health seeking. The sociodemographic details included age, religion, the highest level of education, and present activity (studying/working/homemakers, etc.). The interviewer asked the questions, for example, “Did you attain the educational level as your wish?” According to the respondents' answer, the interviewer probed further “Can you explain the reason why you could/could not attain the education as per your wish?” The question was open-ended and the interviewer wrote down the information, and later, it was categorized by the investigator. The domestic chores and daily life domain items and violence domain items from a 24-item gender-equitable scale, which is part of compendium of gender scales available at www.c-changeprogram.org, were included in the questionnaire to assess the attitude toward gender-equitable norms on these two domains. There are five items in the domestic chores and daily life domain and six items in the violence domain. The items were scored on a 3-point scale, where 1 = agree, 2 = partially agree, and 3 = do not agree, and the responses were summed. High scores show high support for the gender-equitable norms. The compendium of gender scales was prepared by a working group as part of Communication for Change – a USAID-funded project; the reliability and validity of the scales were already tested in different countries. The Malayalam version of the questionnaire was used for the survey. The translated questions were verified by the researcher and one other expert before operating it. MS Excel was used for data entry, and Intercooled STATA 14.1 software package (STATA Corp, 4905 Lakeway Drive College Station, Texas 77845 USA) was used for data analysis. The analysis was mainly descriptive. Pearson Chi-square test was used to check the significance of the associations. The number of participated unmarried and married women was 104 and 203, respectively. Even though all women were in the age group of 18–28 years, a higher proportion of unmarried women were in the age group of 18–21 years followed by 22–24 years and 25–28 years, whereas the age distribution of married women was in the reverse order [Table 1]. More than 60% of both groups of women were Hindus. The main activity of unmarried women was studying, but the married women were mainly homemakers. The proportion of women who had a graduation or above was high among unmarried compared to married women. The young women's attitudes toward gender-equitable norms are given in [Table 2] and [Table 3]. The high support to gender-equitable norms on domestic chores and daily life domain items was quite low among both groups of women; however, a higher proportion of unmarried women showed high support (29%) compared to married women (18%). Gender-equitable norms on violence domain items also showed a similar pattern, and the proportion of unmarried women who showed high support was larger than the proportion of married women who showed high support to it (25% vs. 13.8%). Majority of married and unmarried women agreed that there are times when a woman deserves to be beaten. The women's perceptions of their educational attainment, decision to work outside the home, and obtaining health care are described in [Table 4]. More than half of married women reported that they did not attain the educational level as their wish, and the main reasons were either marriage/pregnancy/childcare (42%) or no facilities (39%). However, among unmarried women, dissatisfaction with the course they have studied was the major reason to say that they did not attain education as their wish (58%) followed by no facilities (29%). All married and unmarried women reported that women have the same right as men to study as much as they want. However, seven married women said that women do not have the right as men to work outside the home. Only 31.5% of married women and 45% of unmarried women opined that they will take the final decision on whether they should work outside home, and majority of the remaining women said that their husband or their parents will take the final decision, respectively. When the women need health care, 65% of married women and 73% of unmarried women were able to make the decision on obtaining health care for them. Either husband or parents will take the decision for the rest of the married and unmarried women. The role of education in supporting gender-equitable norms and decision-making were analyzed separately for unmarried and married women [Table 5]. The higher level of education significantly improved the support to gender-equitable norms on domestic chores and daily life domain in married women. However, among unmarried women, education did not make a significant difference in the support to gender-equitable norms. In addition, education did not show any significant relationship with violence domain items both in married and unmarried women. Regarding the ability to take decisions on work and health-care seeking, married women with a low level of education had significantly less ability to take decisions themselves. In the current study, the support to gender-equitable norms on domestic chores and daily life domain was significantly high among married women who had a higher level of education. However, the score was not significantly related to any socioeconomic factors in unmarried women. It is also noted that a large proportion of unmarried women showed high support to gender-equitable norms on domestic chores and daily life domain compared to married women. There may be changes in women's attitude after their marriage because of the influence of the husband's attitude and the real circumstances they are facing in another family. The support to gender-equitable norms on violence domain items not even significantly related to the educational status of both married and unmarried women. Even though education is a key predictor of autonomy, most often women are not permitted to challenge gender relations because the deep-rooted social customs and practices shape the choices of women. The present study indicates that education is interrupted in one out of two married women in the age group of 18–28 years due to marriage/pregnancy/childcare or lack of facilities. The inverse direction of the age distributions of married and unmarried women and the low percentage of married women who attained graduation or above compared to unmarried women can be connected with this observation. Despite the higher levels of educational attainment of women in Kerala, they had less autonomy in their reproductive and household decision-making. The current study also shows the same observations. Almost all women reported that women have the same right as men to study as much as they want and to work outside the home. On the contrary, only one-third of married women had the opinion that a woman herself can take the final decision to accept a job outside the home. This clearly indicates that women are aware of their rights to study and work, but the social norms forbid them from taking decisions. The higher level of education and the ability to earn cash were the two important factors affecting women's decision-making on health seeking., The present study highlights that marriage affects the decision-making on whether to work outside home and to seek health care for women and women with high level of education had relatively better but not a satisfactory level of decision-making power. The major limitation of this study is that only the two domains of gender-equitable norms were included in the questionnaire that limits exploring the extent of attitude toward gender-equitable norms on different levels. The main purpose of including these scales was to assess how the attitude toward these norms influences the contraceptive preference of young married women when their desired family size is complete. However, more than 90% of married women reported that they prefer tubal sterilization when their family size is complete, and there was no scope in analyzing the attitude versus preference due to the imbalance in the strata with number of women preferring other methods, and hence, the present paper is limited to describe the attitude toward gender-equitable norms. In Kerala, nowadays, women constitute the major portion of the formal education sector, and it shows the gender sensitization and gender equality in the field of education. However, the present study suggests that most women do not have a positive attitude toward gender-equitable norms. Even though the women are well educated, the freedom in decision-making and the support to gender-equitable norms are not satisfactory. In addition, the lack of resources and the responsibilities after marriage interrupts the education of more than half of married women in the age group of 18–28 years. Since the attitude toward gender norms and decision-making capacity of young women are strongly connected with social norms and practices, the major constituent of women in the educational sector cannot make any serious change in the attitude toward gender-equitable norms. If the schools and universities include activities to empower women in terms of gender equity by including both male and female, students along with the curriculum of their academic course can make a change in the attitude of the young generation. The program should focus on both males and females since the change in the attitude of men is one important factor that influences the attitude of women toward gender-equitable norms. Ford Foundation is acknowledged for their generous support in conducting this survey. Dr. Sundari Ravindran is acknowledged for her help and guidance in conducting the study and preparing the report. This study was financially supported by Ford Foundation. CREA. Adolescent Sexual and Reproductive Health and Rights in India 2005. Creating Resources for Empowerment in Action (CREA). New Delhi: CREA; 2005. Available from: http://www.nipccd-earchive.wcd.nic.in/sites/default/files/PDF/18%20adolescent%20working%20paper.pdf. [Last accessed on 2015 Jan 15]. World Health Organization. Defining Sexual Health. Available from: http://www.who.int/reproductivehealth/topics/sexual_health/sh_definitions/en/. [Last accessed on 2015 Jan 15]. Jejeebhoy SJ, Santhya KG. Sexual and Reproductive Health of Young People in India: A Review of Policies Laws and Programmes. New Delhi: Population Council; 2011. Shettar RM. Study on issues and challenges of women empowerment in India. IOSR J Bus Manage 2015;17:13-9. Available from: http://www.iosrjournals.org/iosr-jbm/papers/Vol17-issue4/Version-1/B017411319.pdf. [Last accessed on 2018 Jun 10]. Acharya DR, Bell JS, Simkhada P, van Teijlingen ER, Regmi PR. Women's autonomy in household decision-making: A demographic study in Nepal. Reprod Health 2010;7:15. Reed E, Donta B, Dasgupta A, Ghule M, Battala M, Nair S, et al. Access to money and relation to women's use of family planning methods among young married women in rural India. Matern Child Health J 2016;20:1203-10. Patrikar SR, Basannar DR, Seema Sharma M. Women empowerment and use of contraception. Med J Armed Forces India 2014;70:253-6. Bhandari TR, Kutty VR, Sarma PS, Dangal G. Safe delivery care practices in Western Nepal: Does women's autonomy influence the utilization of skilled care at birth? PLoS One 2017;12:e0182485. Fleming PJ, Agnew-Brune C. Current trends in the study of gender norms and health behaviors. Curr Opin Psychol 2015;5:72-7.
International Planned Parenthood Federation (IPPF). Sexual and Reproductive Health and Rights – The Key to Gender Equality and Women's Empowerment. Newhams Row, London SE1 3UZ, UK: International Planned Parenthood Federation; 2015. Thampi BV. Determinants Female Autonomy and the Impact of Autonomy on Women's Well-Being in Kerala, India – An Analysis of NFHS (II). France: International Population Conference; 2005.
International Institute for Population Sciences (IIPS) and ICF 2017. National Family Health Survey (NFHS-4), 2015-16: India. Mumbai: IIPS; 2017. Available from: http://www.rchiips.org/NFHS/NFHS-4Reports/India.pdf. [Last accessed on 2018 Jun 10]. Thulaseedharan JV. Awareness and actual knowledge regarding contraceptive methods among young women in Trivandrum district, Kerala, India. Int J Med Sci Public Health 2018;7:103-9. Thulaseedharan JV. 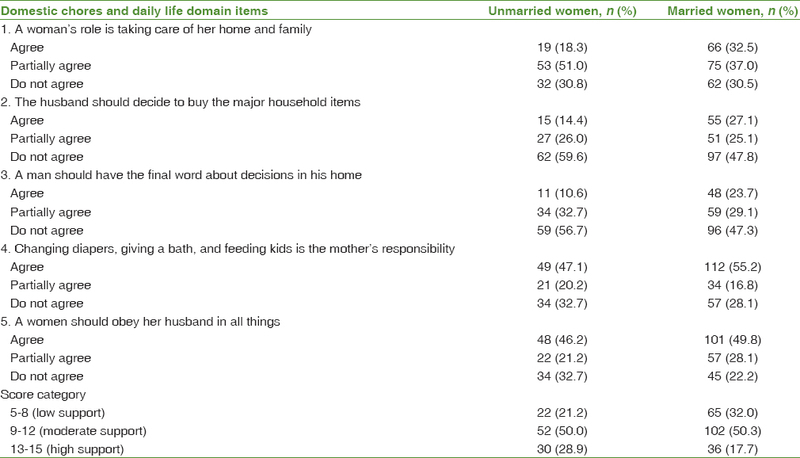 Contraceptive use and preferences of young married women in Kerala, India. Open Access J Contracept 2018;9:1-0.
International Institute for Population Sciences, District Level Household and Facility Survey 2008, Ministry of Health and Family Welfare; 2008. Available from: http://www.jsk.gov.in/dlhs3/kerala.pdf. [Last accessed on 2014 Jan 15]. Geeta N. Compendium of Gender Scales. Washington, DC: FHI 360/C-Change; 2011. Available from: https://www.c-changeprogram.org/content/gender-scales-compendium/resources.html. [Last accessed on 2014 Apr 29]. Eapen M, Kodoth P. Family Structure, Women's Education and Work: Re-Examining the High Status of Women in Kerala. Issue 341 of Working Paper, Centre for Development Studies, Trivandrum, India; 2002. Bhandari TR, Kutty VR, Ravindran TK. Women's autonomy and its correlates in Western Nepal: A demographic study. PLoS One 2016;11:e0147473. Senarath U, Gunawardena NS. Women's autonomy in decision making for health care in South Asia. Asia Pac J Public Health 2009;21:137-43. Rasheeja TK, Krishnan C. Empowering women through higher education: The Kerala Episode. Issues Ideas Educ 2013;1:221-9.